Star formation is inefficient. Only a few percent of the available gas in molecular clouds forms stars, leading to the observed low star formation rate (SFR). The same holds when averaged over many molecular clouds, such that the SFR of whole galaxies is again surprisingly low. Indeed, considering the low temperatures, molecular clouds should be highly gravitationally unstable and collapse on their global mean freefall timescale. And yet, they are observed to live about 10-100 times longer, i.e., the SFR per freefall time SFR_ff is only a few percent. Thus, other physical mechanisms must counteract the quick global collapse. Turbulence, magnetic fields and stellar feedback have been proposed as regulating agents, but it is still unclear which of these processes is the most important and what their relative contributions are. 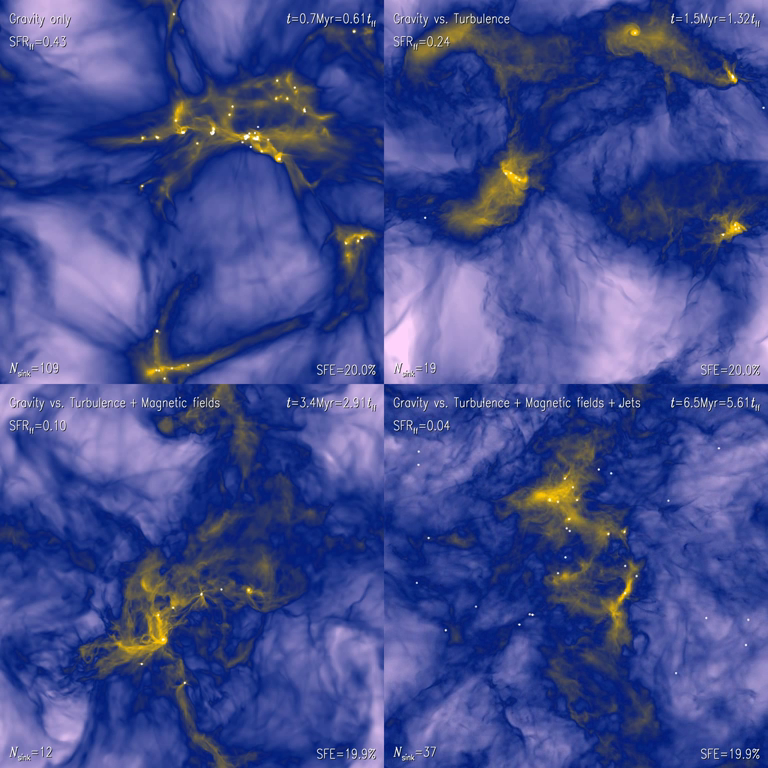 Here we run high-resolution simulations including gravity, turbulence, magnetic fields, and jet/outflow feedback. We confirm that clouds collapse on a mean freefall time, if only gravity is considered, producing stars at an unrealistic rate. In contrast, if turbulence, magnetic fields, and feedback are included step-by-step, the SFR is reduced by a factor of 2-3 with each additional physical ingredient. When they all act in concert, we find a constant SFR_ff=0.04, currently the closest match to observations, but still about a factor of 2-4 higher than the average. A detailed comparison with other simulations and with observations leads us to conclude that only models with turbulence producing large virial parameters, and including magnetic fields and feedback can produce realistic SFRs. This shows an animation of the column density in each of our main simulation models: Gravity only (top left), Gravity vs. Turbulence (top right), Gravity vs. Turbulence + Magnetic Fields (bottom left), and Gravity vs. Turbulence + Magnetic Fields + Jet/Outflow Feedback (bottom right). The simulation time is shown in the top right corner of each panel. The end time increases significantly for each model that adds physical processes opposing gravitational collapse. This demonstrates that only the combination of turbulence, magnetic fields and jet/outflow feedback can produces realistic star formation rates. I thank Enrique Vazquez-Semadeni and the anonymous referee for their useful comments on the manuscript. C.F. acknowledges funding provided by the Australian Research Council's Discovery Projects (grants DP130102078 and DP150104329). The author gratefully acknowledges the Jülich Supercomputing Centre (grant hhd20), the Leibniz Rechenzentrum and the Gauss Centre for Supercomputing (grant pr32lo), the Partnership for Advanced Computing in Europe (PRACE grant pr89mu), and the National Computational Infrastructure (grant ek9), supported by the Australian Government. This work was further supported by resources provided by the Pawsey Supercomputing Centre with funding from the Australian Government and the Government of Western Australia. The software used in this work was in part developed by the DOE-supported Flash Center for Computational Science at the University of Chicago.